In the future, ultrahigh-speed spintronics will require ultrafast coherent magnetization reversal within a picosecond—one-trillionth of a second. Spintronics centers on an electron's spin and magnetic moment in solid-state devices. While this may eventually be achieved via irradiation with a nearly monocyclic terahertz pulse, the small change of magnetization, or modulation, it generates has so far prevented any practical application of this technique. Generally, the "magnetic field" component of a terahertz pulse is considered to be the origin of the coherent terahertz response of the magnetization. But, as a group of University of Tokyo researchers previously discovered, the "electric field" component of a terahertz pulse plays a key role in the terahertz magnetization modulation of semiconductor-based ferromagnetic materials. Now the group reports in the journal Applied Physics Letters, that their initial discovery inspired them to explore ferromagnetic nanoparticles embedded within a semiconductor. Their theory was that the electric field of the terahertz pulse could be effectively applied to each nanoparticle due to the small energy loss of the terahertz pulse during its propagation through a semiconductor. "Until now, ferromagnetic metal films have been used for studies on the terahertz modulation of the magnetization," said Shinobu Ohya, an associate professor at the University of Tokyo. "The modulation ratio reported so far has typically been less than ~1 percent of the saturation magnetization." 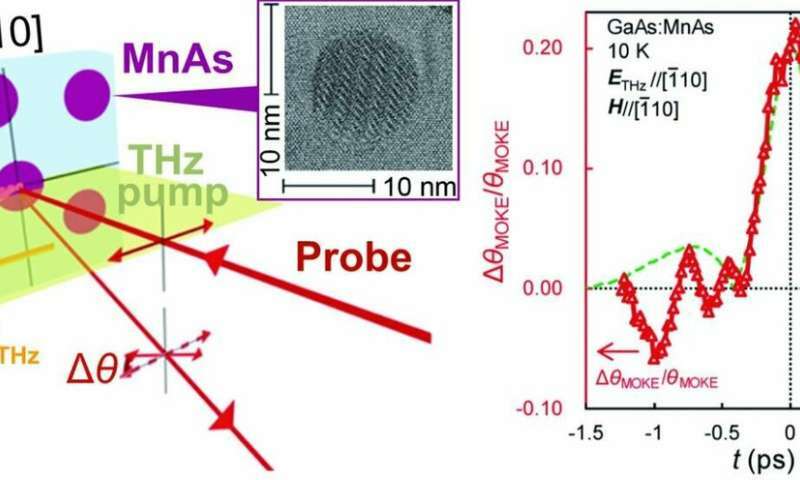 To test their theory, the group used a 100-nanometer-thick semiconductor gallium arsenide (GaAs) film embedded with ferromagnetic manganese arsenide (MnAs) nanoparticles. "The small energy loss of the terahertz pulse during the propagation in our film allows it to penetrate the film. This means that the strong terahertz electric field—with a maximum intensity of 200 kilovolts/centimeter—is uniformly applied to all of the ferromagnetic nanoparticles," said Ohya. "This strong electric field induces the large magnetization modulation via the modulation of the carrier density in the MnAs nanoparticles, thanks to the spin-orbit interaction." "Our results will lead to an ultrafast coherent magnetization reversal within a picosecond, which will be an essential technique for ultrahigh-speed spintronics," Ohya said. "Ferromagnetic nanoparticle systems are extremely promising for high-speed magnetization switching using terahertz pulses."